Oceanwide Expeditions acquires the vessel m/v "Marina Svetaeva"
Oceanwide Expeditions has expanded its fleet with the addition of the 100-passenger vessel "Marina Svetaeva". The vessel will be re-flagged and renamed "Ortelius". As Plancius, Ortelius was a Dutch / Flemish cartographer. Abraham Ortelius (1527 – 1598) published the first modern world atlas, the Theatrum Orbis Terrarum or Theatre of the World in 1570. In order to offer additional capacity for some of the currently sold out voyages aboard "Plancius", our new vessel "Ortelius" will start operating cruises in Antarctica from 31 December 2011. The first voyage ending on 25 January 2012 is already sub-chartered, but we have secured an additional 18-nights departure to the Falkland Islands, South Georgia and the Antarctic Peninsula from 25 January until 12 February 2012, followed by a 10-nights voyage to the Antarctic Peninsula from 12 until 22 February 2012. The ice-strengthened vessel "Ortelius" is an excellent vessel for Polar expedition cruises in the Arctic and Antarctica, providing us with possibilities to adventure remote locations such as the Ross Sea and Franz Josef Land. "Ortelius" was built in Gdynia, Poland in 1989, was named "Marina Svetaeva", and served as a special purpose vessel for the Russian Academy of Science. 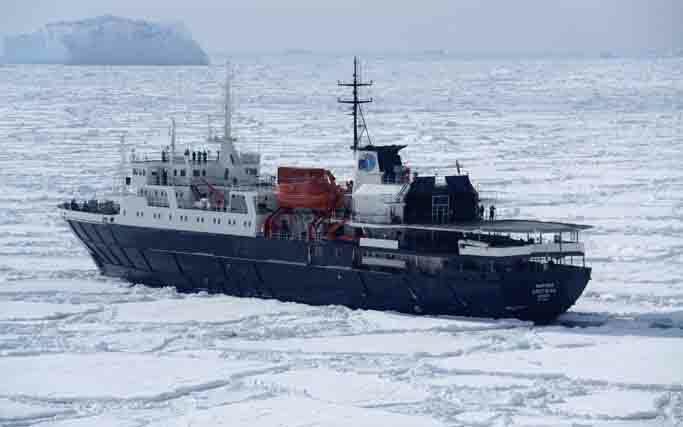 The vessel has the highest Russian ice-class notation (UL1 equivalent to 1A) and is therefore very suitable to navigate in solid one-year sea ice and loose multi-year pack ice. "Ortelius" offers a comfortable hotel standard, with two restaurants, a bar/lecture room and a sauna. She can accommodate 100 passengers, has plenty of open-deck spaces and a large accessible bridge. A considerable number of quadruple and twin cabins with shared facilities (toilet and showers to be shared in the corridors) offer attractive lower starting prices for our Polar voyages. The cabin lay-out is as follows: 5 quadruple cabins with bunk beds and shared facilities (these can also be used as triple or twin cabins); 14 twin cabins with 2 lower single berths and shared facilities; 9 twin cabins with portholes, private toilet and shower and 2 single lower berths; 10 twin cabins with windows, private toilet and shower and 2 single lower berths; 6 superior cabins with double beds, private toilet and shower and a separate day room, and 1 suite with a double bed, private toilet and shower and a separate day room. All cabins are spacious outside cabins with a minimum of two portholes or windows per cabin. The vessel offers basic but comfortable cabins and public spaces. The vessel is manned by 34 highly experienced Russian nautical crew, 15 international catering staff, including stewardesses, 6 expedition staff (1 expedition leader and 5 guides/lecturers) and 1 doctor. Our voyages are primarily developed to offer our passengers a quality exploratory wildlife program, trying to spend as much time ashore as possible. As the number of passengers is limited to approximately 100 on the "Ortelius", flexibility assures maximum wildlife opportunities.